Way back in May when Holly was born, Fisher Price sent us a Discover 'n Grow Twinkling Lights Projection Cot Mobile for Holly's cot. It has taken me a while to write up the review because Holly was in a moses basket and then a crib where the mobile wasn't suitable for use, but at about 5 months old we moved Holly into her own room and into a big cotbed where the Fisher Price mobile took pride of place. 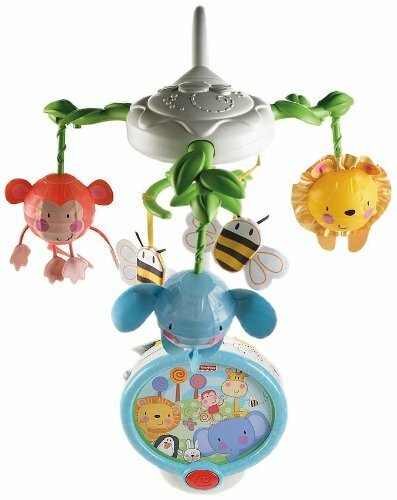 The mobile looks like a WHOLE lot of fun and I knew Holly would enjoy it. It was just a bit frustrating that we couldn't use it on the crib (the instructions stated that there had to be a minimum height between the top of the cot and the place where you were to fix the mobile). The first thing we noticed when we fitted the cot mobile was that it was chunky and heavy. There is a big metal bar that rises up from the musical box, over the cot and then from a box at the top dangles three little coloured animal lanterns and some fabric bees. There is a motor in the top box which causes the animals and bees to rotate. All this means that the mobile is heavy and requires some very good fastenings on the side of the cot. Even then, it does tip ever so slightly due to the weight but because of the security of the fastenings I wasn't worried in any way. I absolutely love the music on the Twinkling Lights Projection Music. It is good quality, has a good range of tracks and is suitably tinkly to bring peace to the nursery. The music lasts for upto 15 minutes which is a good long period - quite often I find music toys to play such a short amount of music that you end up having to go back and disturb your baby to start the music up again! The music almost always does its job in helping Holly fall asleep. Although the red, blue and yellow lantern toys were fun, I think they were just a bit too engaging for Holly. When I used the mobile on the setting that caused them to light up, she would spend her time smiling and watching them rather than falling asleep! As it is, the top arm of the mobile has to be removed at around 5 months old as soon as your baby starts getting mobile and may be able to reach up and grab the pieces - you wouldn't want them dragging that heavy thing down on to them! This meant that the mobile part of the projector didn't get very many weeks of use in our house. Now we just use the music box which contains the projector. There are a number of different settings which play music with or without the blue stars projecting onto the ceiling. The music box has a little button on the side so that your baby can switch it on and off too. So far Holly has never pressed it by accident in her sleep (I wonder if the music would wake her up?) but she often starts it up in the morning and I go through to see her smiling! The mobile also comes with a 'remote control' which allows you to turn the music and projector on and off without having to fiddle around with the buttons and disturb your child. I thought this would be a piece of genius and it is, but would be far better if it worked even more remotely - currently it only works if you are in direct line of sight with the mobile which means I can't just switch it on from our bedroom if she stirs during the night. Shame!